The scent of Paeonia Florence Nicholls can be described as light and fresh and evokes a summery vibe. Because of this delicious fragrance she is the perfect peony variety for lovers of the so called "parfum flowers". But there is more to want. The white flowers have a pink glow to them and are huge and opulent. Hence this presentation Florence Nichols is one of our best "blush" peonies and therefore extremely popular in the wedding season. The variety Florence Nicholls is overwhelming for many reasons. In the first place because she is a double-flowered peony that blooms in the shape of a rose. On top of that she has formidable flowers that can grow up to 17 cm in full bloom. 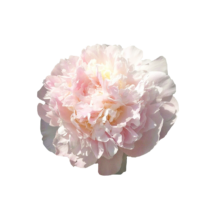 Therefore she can measure herself with big, blush peony varieties as Moon over Barrington or Dynasty. Florence Nicholls was bred in 1938 as a seedling of the peony variety Mme. Calot and is named after Mrs. J.C. Nicholls. 1: Florence Nicholls is a very large peony. Therefore she definetly needs some extra space in the vase. 2: Secondly, to avoid squeezed vains, cut its stems diagonally so you can enjoy your peonies longer. 3: Finally, put them in some lukewarm water and start enjoying!